Prepare for the Boating Season! With the spring time hitting and the un-normally warm March weather hitting most of the country, boating season will be starting soon if it hasn't already. Make SS Nautical your place to buy boat registration numbers. Start the season off fresh with a new set of registration numbers. Registration numbers ship out quickly. Happy Boating! No more digging through piles of changeable sign letters. Message changes are quick and easy when you can select and refile sign letters quickly and efficiently. Message board signs are an effective form of advertising. Change your message often to get the best bang for your buck. By keeping your sign letters organized, it will be easier to change your message. Changeable sign letter storage cabinets are available for nearly every size sign letter. Visit SignOutfitters.com for more information. New Product - Sidewalk sign with letters. EXTRA LARGE Ultimate Quick-Load "A" Frame Sidewalk/Curb Sign. Quick Load rolling A-frame sidewalk sign with changeable message board, 2 sided. Just Grip-Tip-Roll to move your sign in or out, no lifting or carrying. The curved sign face deflects winds of up to 30+ mph. Tip 'n Roll feature allows sign to be moved easily with no lifting or carrying. Great in wet weather! Truly a portable sign. QLA™ Sidewalk signs are made from rustproof techno-polymers with internal steel supports for durability and stability in rainy or windy conditions. Its narrow profile easily fits through any door. For more information or to purchase visit our online sign store - Sidewalk Signs. Do you need a sign for your storefront or one that hangs from the window? We have just the sign for you. It is the Triplex 3 in 1 Sign. It has copy on 3 panels. (2 single line panels and 1 double line panel.) Comes with 196 - 4 inch characters, 10 - 8 inch numbers with the % sign. 36 inch wide display area. When ordering plastic sign letters the panel size and the imprinted letter height are required. 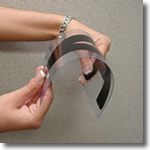 The panel size is the the measurement of the height of the clear plastic panel which the letter is printed on. 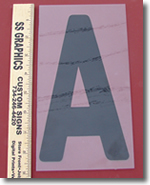 The most common size for Flex Change Letters is 8 inch letter imprinted on an 8 7/8 inch panel. The most common style is Condensed. The Condensed letter style allows for more letters per line of sign copy. This size and style is shipped with all of our lighted portable roadside signs. Condensed Flex Change Letters are also available in these sizes: 6 inch letter imprinted on a 6 7/8 inch plastic panel and 8 inch letter imprinted on a 8 1/2 inch plastic panel. Flex Change Letters are also available in Block style. Block is not used as often as condensed due to its characters per line limitations as opposed to condensed. Block Flex Change Letters are available in these sizes: 4 inch letter imprinted on a 5 inch plastic panel, 6 inch letter imprinted on a 6 7/8 inch plastic panel, 8 inch letter imprinted on a 8 7/8 inch plastic panel, 8 inch letter imprinted on a 8 1/2 inch plastic panel, and 10 inch letter imprinted on a 10 7/8 inch plastic panel. What is the difference between Flex Change and Rigid Sign Letters? This is a very common question. Everyday we receive multiple calls from customers asking what the difference is between Plastic Flexible Sign Letters and Plastic Rigid Sign Letters. One commonality of Flexible and Rigid Letters is how they are specified. The height of the plastic panel and the height of the screen printed letter is required for ordering. 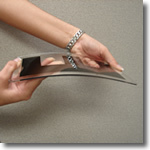 Flexible Sign Letters (Flex Change Letters) are made from.030" (approximately 1/32") thick plastic. Flex Letters are very inexpensive and are typically used in roadside portable signs. Flex Letters are screen printed and have minimal UV inhibitors (the life span of Flex Change Letters is impacted by the intensity of sun in your region) in the plastic substrate used to make the letter panels. Finally, Flex Letters are for use in Texas Track. Texas Track holds the letters in position tightly through compression. Flex Change Letters are bent into position for placement and can not use a suction cup style letter changing pole these letters must be installed by hand. This installation requirement makes it impractical to use these letters in locations without easy access, such as high on a sign pole or building. Also, note that Flex Change Letters are sold as sets only. The most common size is 8" letter on a 9" panel. The most common Flex Change Letter style is condensed. Signoutfitters.com ships a 300 set of 8 on 9 Flex Letters with each portable sign we sell. Rigid Sign Letters (Wagner Zip Change and Gemini Letters) are made from .080" thick plastic (approximately 3/32") thick plastic. Rigid Sign letters are also screen printed however, they are very stable in direct sunlight. Rigid Sign letters work in a push-up / drop-in style track. These letters do work with suction cup style letter changing poles. Changeable signs requiring rigid letters are often seen at the top of sign poles, building walls, and for gas station price signs. Rigid letters are sold individually. In conclusion, Flex Change Letters and Rigid Sign Letters are not interchangeable. Flex letters will blow easily out of rigid sign track. Rigid letters are too thick to fit into Texas Track. Do not be tempted to replace your rigid sign letters with Flex Change Letters because of the price point.